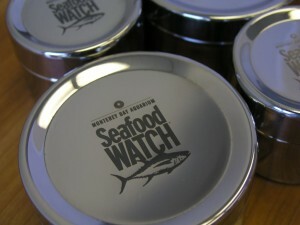 Laser Engraving Gifts and Promotional Items - Laser Impressions Inc.
Laser Engraved Stainless Steel Tins engraved by Laser Impressions for Monterey Bay Aquarium’s Seafood Watch Campaign, www.seafoodwatch.org. Today’s businesses are turning to promotional laser engraving to leave an impression that is memorable, clean, and precise. Promotional tools have become more sophisticated over the years. Though silk-screening, pad printing, and stamping were once very popular, today’s corporate leaders prefer laser engraving. Symbolically, custom laser engraving communicates a message of permanence and stability that printed logos lack. Corporate leaders want to give their customers and clients promotional products that have been laser engraved with a company’s logo because they know that by doing so, their customers will see their company’s mark and it will last forever. Laser Impressions specializes in difficult laser engraving jobs, which expands the possibilities for businesses that want to develop promotional products made of wood, aluminum, stainless steel, titanium, or other materials. Because the company name or logo is etched using lasers, the quality of each individual item is clean and precise, even for items ordered in high quantities. Laser Impressions can accommodate orders of any quantity from 1 to 1,000 and each and every item will have the same permanent, high quality etching, perfectly oriented on the product. The laser engraved iPad is incredibly popular as well as laser engraved iPhones and Kindle readers. Laser Impressions was one of the first to offer laser engraving on technological devices. Choosing the right promotional tool like an iPad or an iPhone is important if you want to make a lasting impression on customers and clients. Your message etched into these items that customers will use every day needs to be able to withstand the wear and tear of constant use. This is why sophisticated technologies like custom laser engraving has become so popular with corporate leaders. With the right promotional item and the right message engraved for all posterity, your business stays at the forefront of customers’ minds. Customers respond positively to the appearance of permanence and precision that’s possible only with laser engraving. If you want to convey a message of stability and strength, silk-screening and stamping may not be for you. Consider custom laser engraving if you want your promotional products to demonstrate that your business is truly on the cutting edge and here to stay. To learn more about Laser Impressions and what we can do for you, please call and speak with one of our laser engraving experts at (800) 344-LASER. There’s no obligation and we’d be happy to answer any questions that you may have. Hello, I am looking to engrave an image for a gift, it would be a design ex: coat of arms on a cylinder tube about 1inch by 1inch, along with a serial number. could you please give me a price quote on what something like this could be. Those stainless steel tins look great!